Louis Armstrong's great hobby was recording, on the big old reel to reel tape machines, he recorded all sorts of music and conversations, his other hobby a hobby within a hobby if you like was decorating the tape boxes, with collages made up of all kinds of images (often photo's of himself) sometimes the images he created directly reflected the tapes contents, more often not. He plastered the images on with sticky tape, that has now yellowed, actually if unintentionally adding to their artistic value. The images from these tape boxes and scrapbooks make up most of this very handsome book. 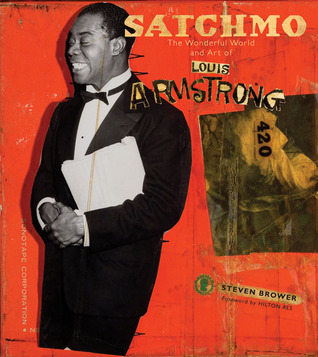 The text by Steven Brower is effusive, if unsubstantial, their are lots of better Armstrong biographies out there, several by Satch himself, but it's the images put to together by the great man himself that make this book unique, images that I, despite being a great admirer of ol' Satch, had no idea existed before picking up this book and that only add to my admiration of the man who I already knew was the greatest entertainer this world of our has ever produced. This book is a collection of images of Louis' collages, scrapbooks, letters, and other documents. Like you might expect, the artwork is wonderful. Everything else in the book? Not so much. All my peeves have to do with trying to use the book for a research project (inadequate documentation of the images, for example, and a seeming presumption of a lack of readerly curiosity on the author's part). But the artwork is, after all, the point of the book. It's a great coffee table book and conversation piece, and the images themselves are worth the price, since most Armstrong fans will never get to the archives in Queens to see the originals. This book exposes readers to a new dimension of Armstrong's visual, linguistic, and musical creativity, and Brower at least deserves credit for putting these images out there. Did you know that Louis Armstrong has a visual side besides his musical genius talents? The book serves as a visual collage diary as well as artwork for all of his personal reel-to-reel tapes. In its most charming level it is sort of like the old mix-cd artwork done by fans, but then on the other plane you are seeing the insides of Louis's personality and genius. Very unique and genius type of book. Much credit to Steven Brower for putting this book together and also a nod towards Eva Prinz for editing this book for Abrams. Buy it now before it disappears! What an amazing person. This collection of hand-made covers of reel-to-reel tape boxes shows a side of Louis Armstrong completely unknown to me, and, just like his music, completely sui generis, completely home-grown and completely, joyfully life-affirming. Wonderful book. Primarily consists of rare photos. Told in a better and more authentic sequence than most photgraphy books or journals. This is a must-have for any Louis Armstrong fan. The collage of writings and artwork is wonderful. Great for the coffee table, too. Satchmo was a charmer, for sure. I would like to own a copy of this one.